Oh, cables. I love you so. It seems that virtually every design I’ve been working on lately is just packet to the brim with cables. Big cables, little cables, simple cables, compound cables. Cables going down sleeves, cables running up the fronts of sweaters. Wide cables, narrow cables, and ones in-between. I’ve made cables with extra-fine sock yarn, and massively bulky yarn. In soft cashmere and utilitarian wool. Cables occupy that perfect space in-between cozy/casual and fancy/embellished. They’re sporty, yet warm. Comfy, but classy. They can be dressed up or dressed down (or, if it’s possible) dressed side to side. I don’t just love the finished products, either. There’s nothing more satisfying than breaking out my cable needle and carefully forming an intricate twist. (Even when I mess up, it’s OK. Figuring out how the cable goes back together is half the fun!) Do you have a particular favorite technique? Or, do you agree with me that cables are the best? This entry was posted in FYI and tagged cable needle, cables, knit cable, knitting on October 2, 2017 by onemilljellybeans. 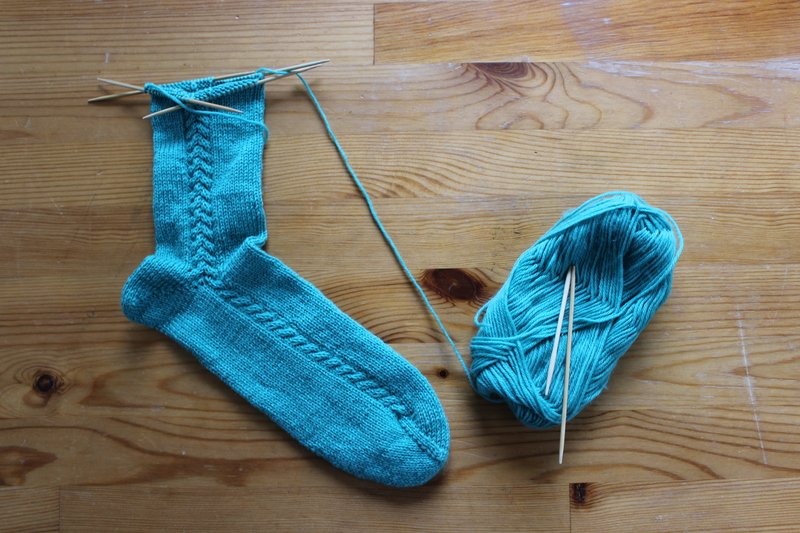 But, these socks are coming along great! I decided that I wanted to have tiny mirror-image cables running up the sides of the legs like this: And at first, I thought that was all I wanted. But you know me- never leaving well enough alone. If there’s a way to embellish. I’ll find it, and sew sequins to it. I can’t wait for the other one to be done (and the weather to cool off again) so I can wear them around! Are you working on any project that’s gotten you excited lately? This entry was posted in On My Needles and tagged cable, cables, knit, knit socks, knitting, socks, toe up on July 3, 2017 by onemilljellybeans. I’m teaching a kids’ knitting class again this semester, and as always it’s a delight. I had a second-grader finish a finger-knitted rug for her cat yesterday, and a first-grader make a pair of hot-pink loom-knitted legwarmers. A fourth-grader spent the last few weeks learning how to needle-knit and then made a candy-striped headband. The kids are super sweet and focused, and there’s nothing better than seeing students go from frustrated to successful! Then there’s one…unique… knitter. I’ll call her Molly- obviously that’s not really her name, because she’s a kid, so I’m not going to be putting her details on the internet. That would be a really bad idea for so many reasons. Anyway, I’ve had Molly in knitting class before. When she showed up in my Fall Semester knitting class, she already kind of knew how to knit with needles. (Kind of knowing is the most dangerous amount of knowledge to have.) I refreshed her memory, and sent her on her way. She was off, knitting up a storm. Now, I’ll admit, I didn’t pay super-close attention to what she was doing. First, Molly is a fiercely smart and independent kid. She doesn’t want any help with anything if she can possibly avoid it. I’d show her a stitch once, and she’d pull the needles away from me and scurry off to sit with her friends and go to work. She didn’t want me looking over her shoulder to check how she was doing. And Second, the rest of the class was crazy last semester- there just wasn’t time to give her uninterrupted attention with 8 other needy kids. But, like I said, she was knitting something that looked really great! She made a big piece of stockinette that we made into a little buttoned pouch. (I assumed she knew how to purl from when she had learned to knit at home.) It was pretty cute! Fast forward to a month ago. My students this semester are a little older, a little more chill. They need less help, which means I can spend more time paying attention to everyone’s knitting, instead of monitoring how much the classroom was being trashed. Molly was looking super bored one day, and she had been really interested in a cabled project I had been working on the week before. I knew she had the basics of knitting really down pat, so I offered to teach her how to make cables. I had her cast on and knit a couple rows normally. From afar, it looked great! Then I sat next to her, to explain how to switch between knits and purls in a single row (you know, switching the yarn forward and back before each stitch). She started working on her knitting, and I watched over her shoulder. AND SHE WAS KNITTING FROM LEFT TO RIGHT! Apparently, she had been knitting for almost a year without ever once flipping her knitting over at the end of a row. In other words, she wasn’t holding her “old stitches needle” in her left hand and her “new stitches needle” in her right hand, swapping out the needles at the end of each row. Instead, her right hand needle was always her right hand needle, and her left hand needle was always her left hand needle! The answer is yes, always yes. Did you have any weird ideas about knitting when you were first learning? This entry was posted in FYI and tagged cables, kids, kids knitting, knitting, learing to knit on May 24, 2017 by onemilljellybeans. I’m not really sure how to celebrate St. Patrick’s day, really. I’m not Catholic, so I won’t be going to mass. I’m not a big drinker, so I’m not going on a bender. And, I’m only part Irish, anyway (maybe- my family history is fairly muddled, but my maiden name was kind of Irish). What I am, though, is a knitter. And if you thought I was going to let a day like this pass by without talking about Irish sweaters (Aran jumpers, in particular), you were wildly mistaken. 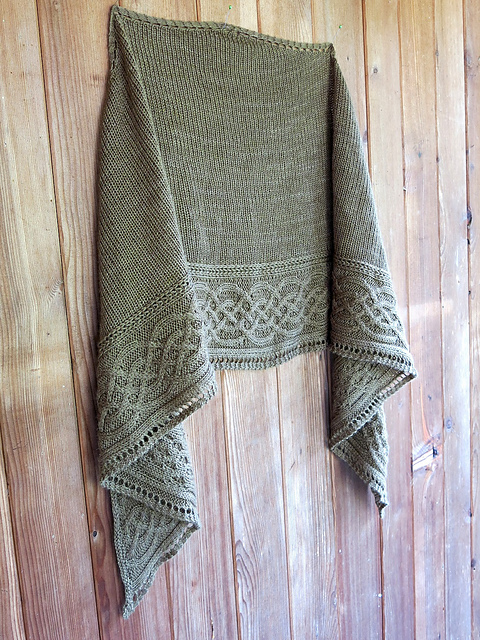 Aran jumpers are simply gorgeous, and they’ve been on my knitting bucket list for years. Originating from the Aran Islands (just off the coast of Ireland), Aran jumpers are the old-school version of an all-weather coat. 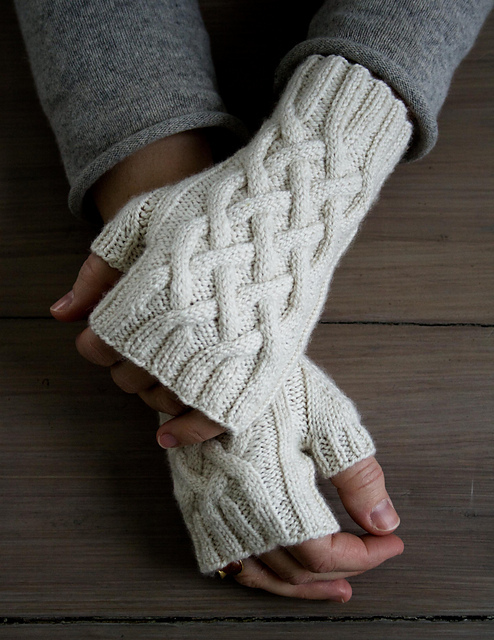 They are traditionally made with untreated wool, so the yarn retains all that good lanolin, making the sweaters perfect for wearing in the rain (something that happens a lot on the Aran Islands), or while fishing on the ocean. Supposedly, each family has a favorite Aran pattern- specific cables that everyone in the family wears, something like each clan having its own tartan. I’m pretty sure that’s a myth, but I love the idea anyway. Of course, these days, people use Aran cables to decorate anything, not just sweaters. This shawl may be simple, but you can definitely see the Aran jumper influence with that gorgeous braided cable along the bottom. Celtic Aran Afghan by Sharondipity Designs I just love this sweater. It’s a modern take on the Aran jumper, oversized and cozy, but still undeniably Aran. And, there’s that cable again, running right up the front! Do you have plans for St. Patrick’s Day? 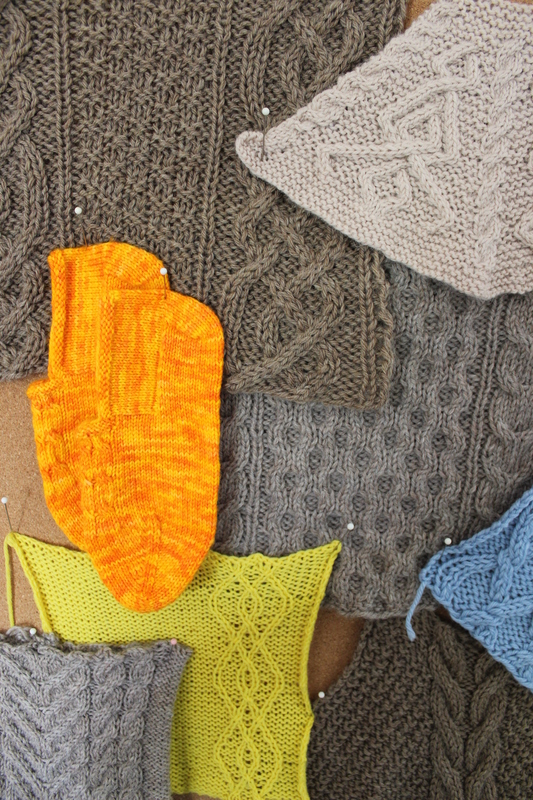 Have you ever knit up an Aran sweater? 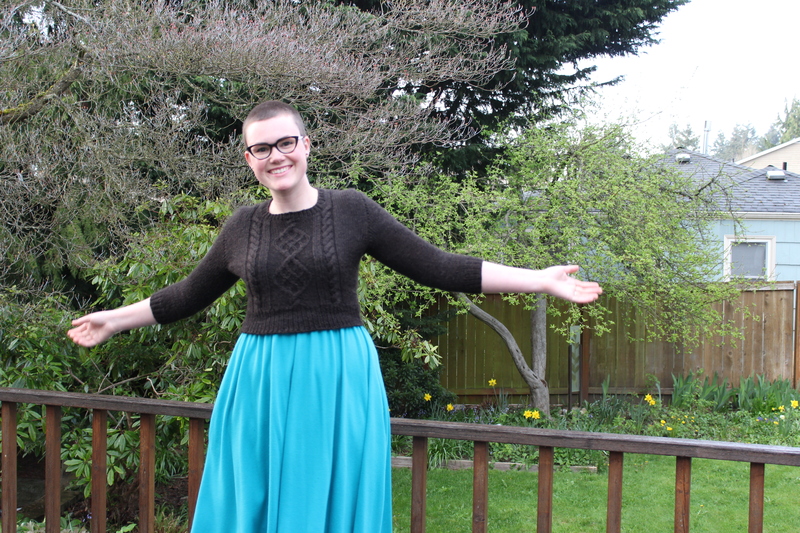 This entry was posted in Inspiration and tagged aran, aran islands, aran jumper, aran sweater, cable, cabled blanket, cabled jumper, cabled sweater, cables, st patrick's day on March 17, 2017 by onemilljellybeans. That’s right, knitters! Surprise! Another pattern- and it’s one I’m super proud of! Introducing: The Laura Shawl! 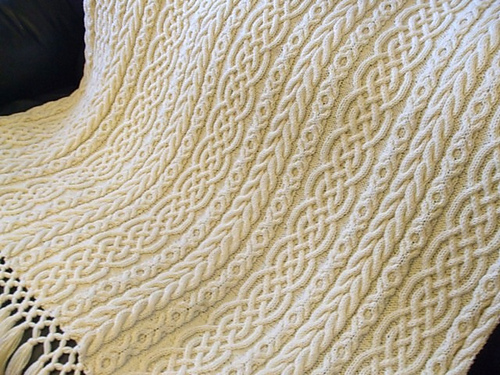 It’s a gorgeous (if I say so myself) cabled wrap, almost six feet long and two feet wide. It looks great wrapped around your shoulders, or cozied up under your chin. And, frankly, it’s big enough to act as a lap blanket when you go out to eat, and they set you too close to a drafty window. 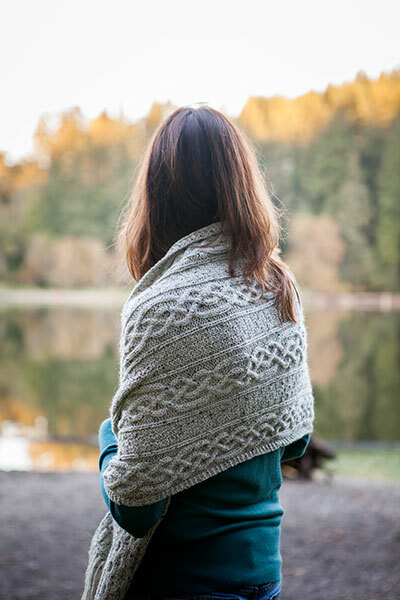 The Laura Shawl is knit in gorgeous tweedy wool that works great with cables. 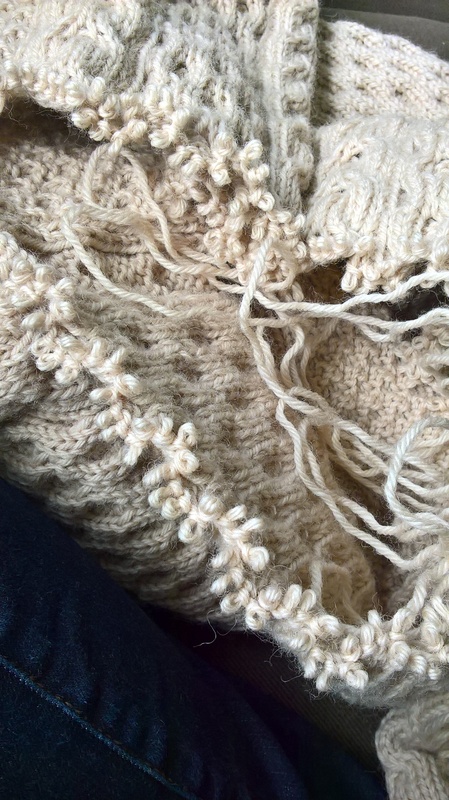 Four wide panels of complex cables are interspersed with some knit/purl texture, and the whole bad boy is finished with thick fringe on either end, just to make it feel extra-luxurious. The best part? 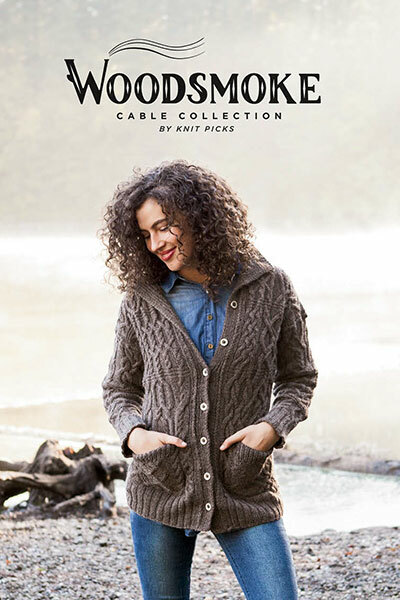 It’s part of another beautiful book from Knit Picks, the Woodsmoke Cable Collection. This book is absolutely breathtaking. 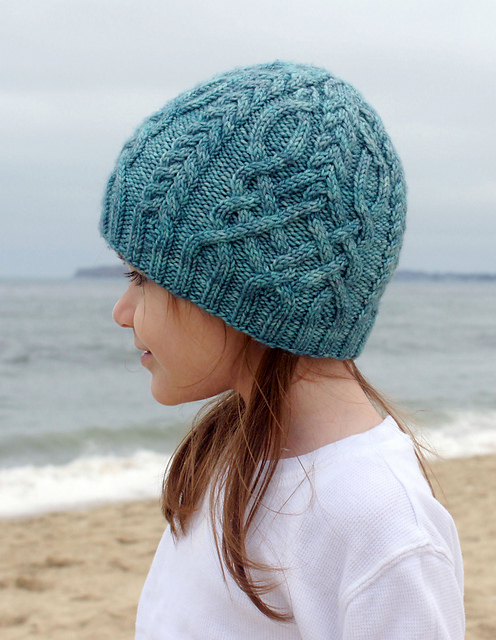 It’s chock full of 16 lushly cabled patterns- sweaters, blankets, scarves and hats. I mean, look at these: Really, I want to work up all of these for myself. (Or maybe have someone else do it so I don’t have to wait?) What’s that? You want a copy? Buy yourself a copy here! This entry was posted in Uncategorized and tagged cable, cable knitting, cables, knit picks, knitting, shawl, sweater, woodsmoke, woodsmoke collection, wrap on January 13, 2017 by onemilljellybeans. 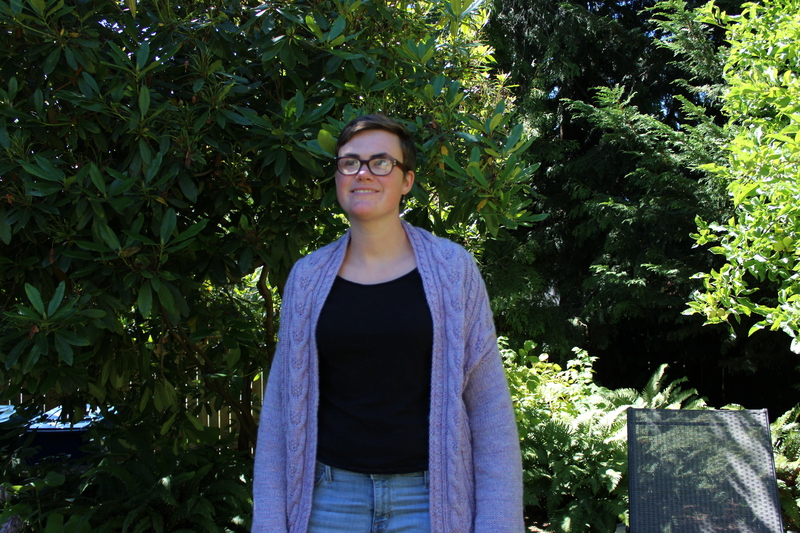 I finally got around to seaming and blocking my Stranger Cardigan! And… I like it. 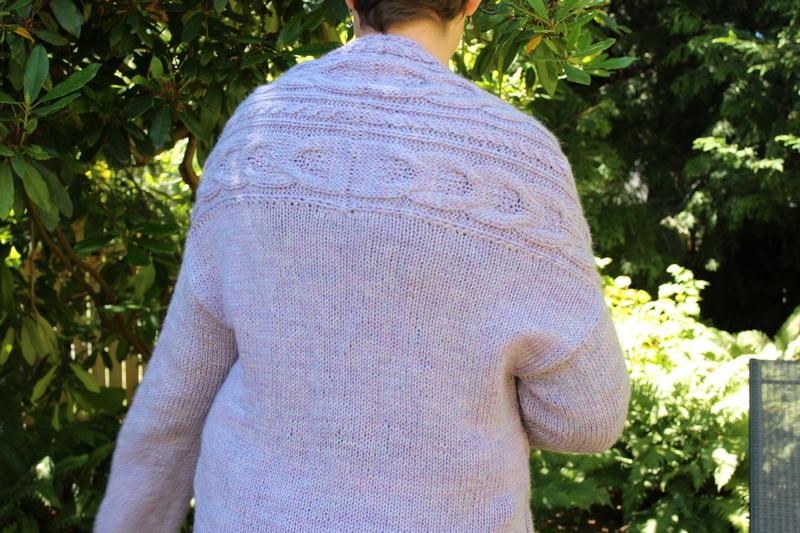 I don’t love it, but I think it’s partly that it took me an age to finish (I get annoyed with projects that take too long), and it’s partly because it’s pretty warm here (and no one loves a thick wool sweater when it’s super hot). Anyway- pictures! Ignore me being a total dweeb. I have trouble looking like a not-crazy person when taking finished project pictures. I like the shoulders- the seam between the two cabled panels is very pleasing- so neat and tidy! And the sweater turned out nice and long- it goes down to my mid-thighs, so it’ll look great in the winter with leggings or jeans and a comfy t-shirt. But, I think it’s a little too long in the arms. I’m always so paranoid about having too-short sleeves, I end up making them too long. It’s a curse. I might rip them back, or I might leave them. It could be nice to have long, cocoon-like sleeves in the dead of winter. Of course, my favorite part is still the lovely cables up the front. That’s what drew me to the pattern in the first place, and I still love them! These cables might find their way onto some other projects, too. I’m pleased with the finished product, all told. And I’m even more pleased that it is finished. What’s your most recent finished object? 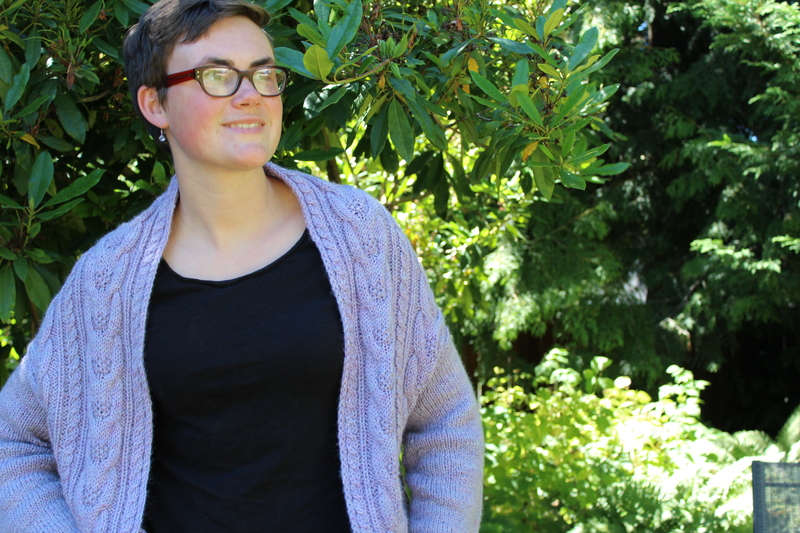 This entry was posted in On My Needles and tagged cable, cabled cardigan, cables, cardigan, done, finished, stranger cardigan on August 8, 2016 by onemilljellybeans. Hello, my name is Allison and I have a problem. I love cables too much. It’s funny, now that I’m on the body portion of my cabled sweater, which is all in stockinette, I’m finding it difficult to keep my attention on it. Where are my cables? Where is my interest? Why isn’t my cable needle out? It makes me kind of sad. And what’s a sad knitter to do, except dream of her next project? 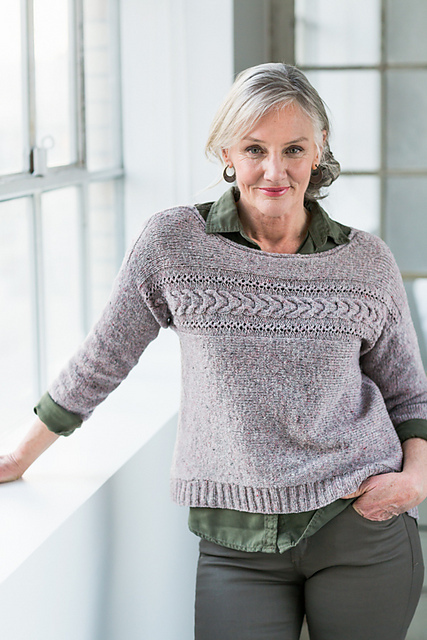 I love the understated simplicity and interesting construction of this pullover. The cable/eyelet combo across the front and back is just gorgeous. But I don’t know if it has enough cables to tame the raging cable monster in my brain. Natsumi by Yoko Hatta These cozy little mitts are super pretty, too. 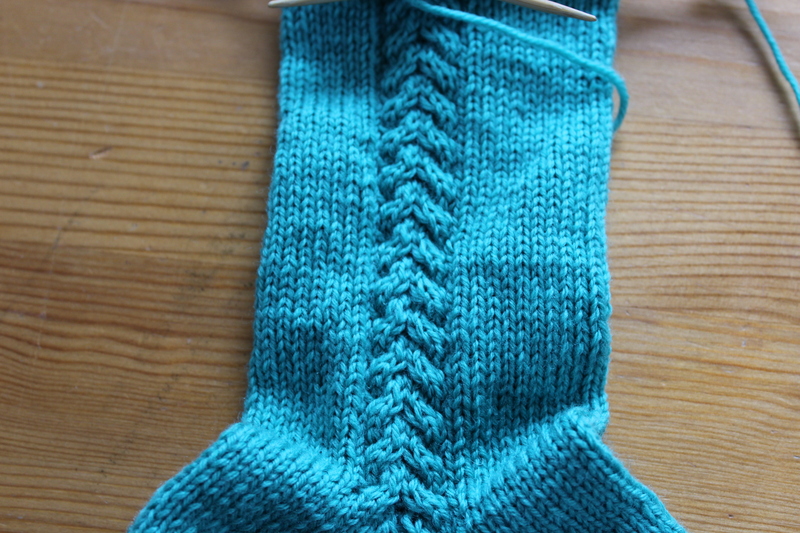 I love how the cables run directly into the ribbing at the top and bottom. But, while the cabling is very pretty, I don’t know if it is unusual enough. Ah ha! This might be perfect! After all I’m looking for the most over the top, ridiculous cable pattern I can find. This hat is nothing but an amazing, beautiful tangle of cable loveliness. And, I can always use a new hat. Snowstorm Hat by Anna Rauf Do you ever get caught up on a specific project or technique? What do you do when you can’t get something out of your head? This entry was posted in Inspiration and tagged cable, cable knitting, cables, hat, knitting, mitt, pullover, sweater on May 30, 2016 by onemilljellybeans. So, I feel like my posts have been a little lacking in content lately. I’ve written a bunch of little, silly posts, about TV and such but nothing with a lot of meat lately. Sorry about that. But I have an excuse. I’ve been working on a monster of a design for KnitPicks. And it’s been eating up all my time. While I still can’t talk about it (not until next year when it’s published), I can tell you I’ve finished it! 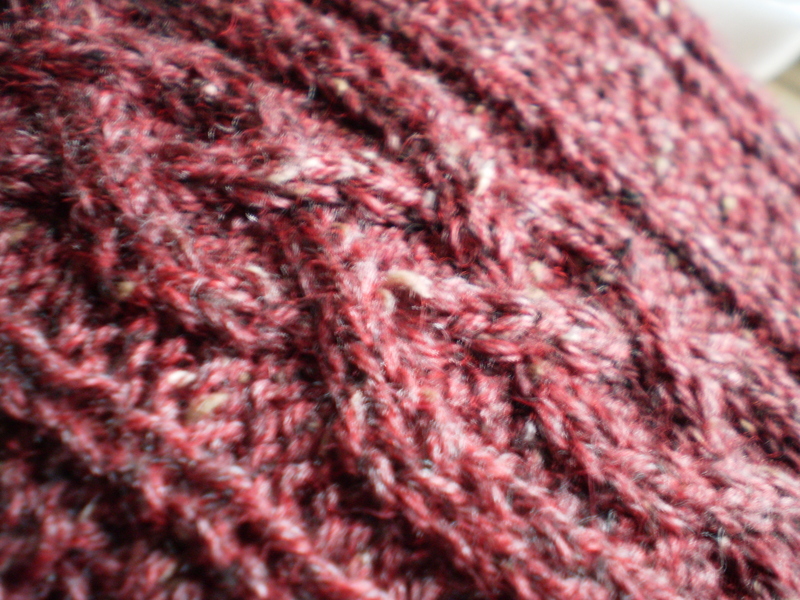 A little under a mile of worsted-weight tweed in garnet red. Tons of cables. And, well, that’s about all I can tell you. Sorry to be all secretive and mysterious, but I’m super excited about this one, both because it’s a really pretty finished object, and because I don’t have to work on it any more! 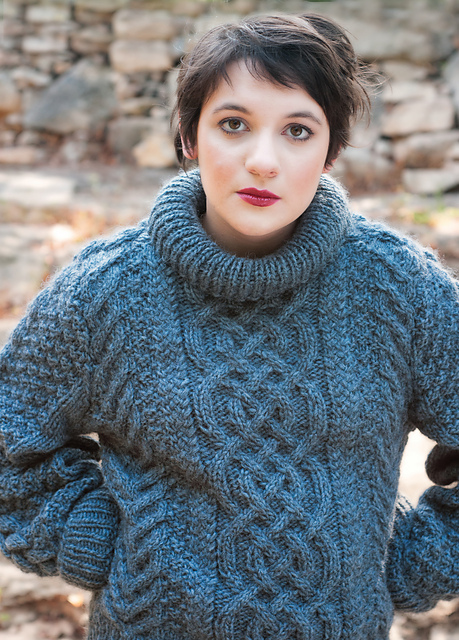 I’m looking forward to showing off this project down the line, but in the meantime, tell me about your most epic knits! I’d love to hear about them. This entry was posted in On My Needles and tagged cables, design, epic, finished, project on May 23, 2016 by onemilljellybeans. Here’s a cool thing about cables- 90% of them are done with knit stitches, and 90% of them only work crossover rows on the right-side. That totally simplifies it, right off the bat! First off, let’s figure out how wide these cables are. This is super easy! 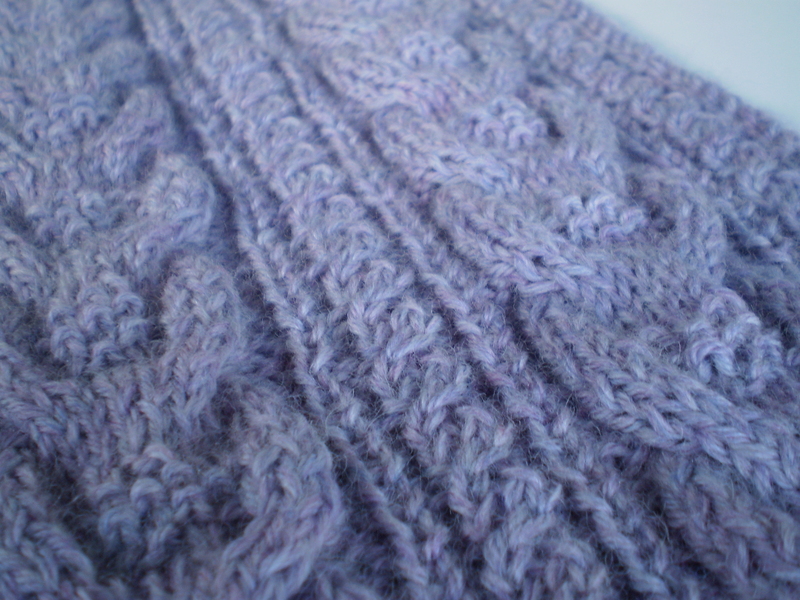 Just look at the widest part of the cable and count the knit stitches across, just like we did last week. The cable on the left is 3 stitches across, and the cable on the right is 4 stitches across. Next, we’ll determine how the crossover is worked for our cable. Look at the narrowest part of the cable (where the two parts of the cable actually cross), and count how many stitches are on top. The cable on the left has 1 stitch on top, and the cable on the right has 2 stitches. This, combined with the width means that the left cable is a 1×2 cable, and the right cable is a 2×2 cable. That’s all there is to figuring out the stitch count for a cable! Next, we need to figure out how many rows each repeat takes. Start by identifying the crossover row. It should be the row where the stitches are all slanted sideways, instead of being nice, upright “v’s.” Then count the rows from one slanty v up to the next one. 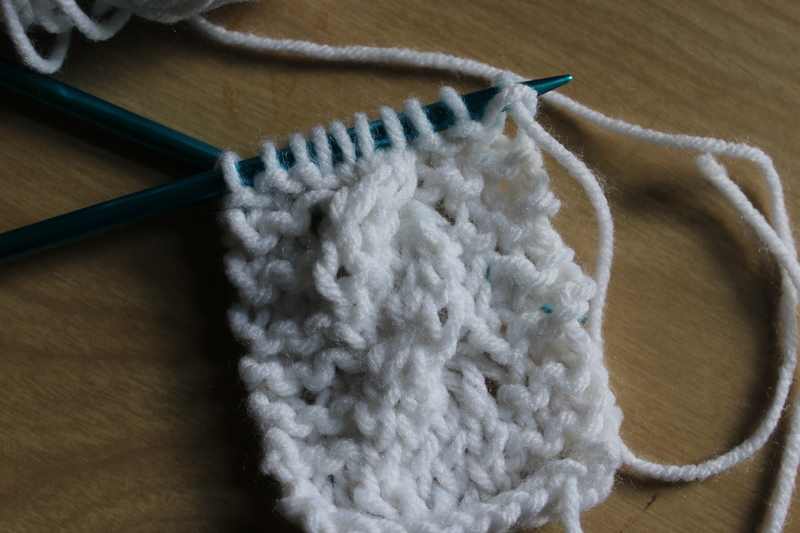 I like to count the outside edge stitches- I think they’re easier to see. The left cable has 3 rows in-between each crossover row, so it’s a 4-row repeat. The right cable has 5 rows between each crossover row, so it’s a 6-row repeat. If we combine all the information we learned, we can come up with the pattern: The left cable is a 3-stitch cable, with a 1×2 crossover worked every 4th row. The right cable is a 4-stitch cable, with a 2×2 crossover worked ever 6th row. So, now that we know the pattern, what’s should we do next to continue the swatch? 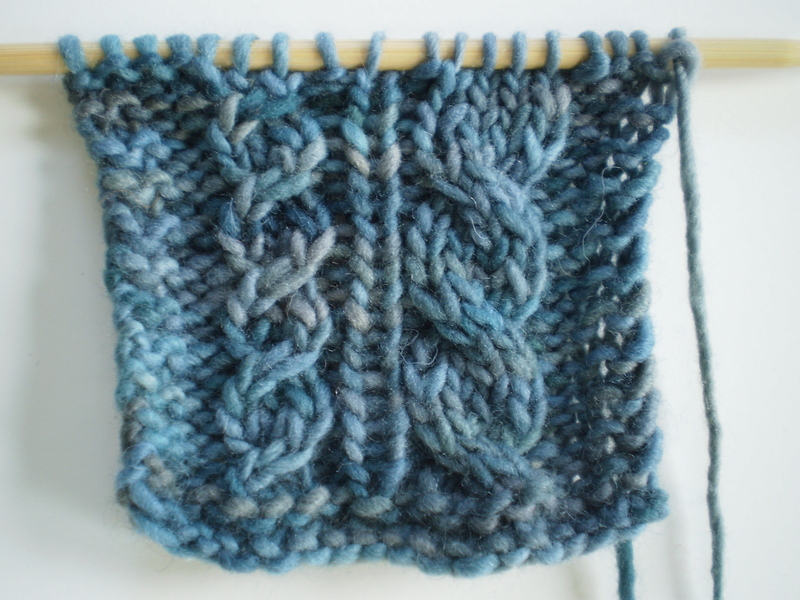 Look down the cable to the most recent crossover row, then count rows up to the needle. The left cable has been worked 1 row past the last crossover, so we need to work 2 more rows even before we make the next crossover. The right cable has been worked 5 rows past the last crossover, so we can work the crossover on the next row. Does that make sense? Do you have any favorite tips for working cables? 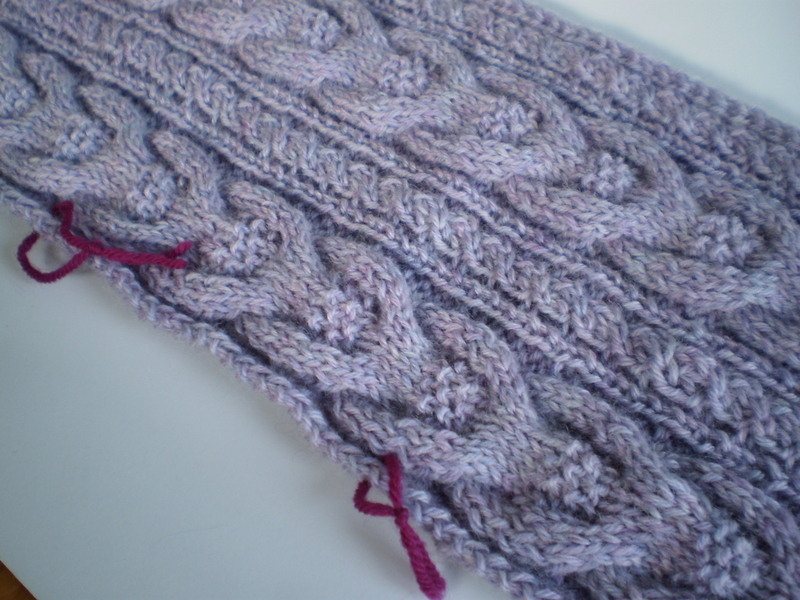 This entry was posted in Tutorial and tagged cable knitting, cables, reading, reading your knitting, rows, stitches, tutorial on April 29, 2016 by onemilljellybeans. Cables sweater- now with even MORE cables! I think I might be in love! At least in love with this cable. It’s such a fantastic combination of beautiful, squishy, substantial, and interesting. The big cable is a 12-row repeat, so it’s keeping my interest, and the little cable is a 4-row repeat, which makes it easy to keep track of where I am in the pattern. I’m enjoying it so much! I’ve finished one side of the sweater front (I think it’s the right front, not that it really matters, because there’s no shaping!). The pattern had me mark a couple spots with scrap yarn- I think these marked stitches will have to do with adding in the sleeves later. But, honestly, I’m not worrying about it too much- I’ve decided that for this sweater, I’m just going to follow the instructions, and trust the pattern writer. It’s very relaxing. I know I just said that I was going to follow the instructions blindly, I can’t help myself to a little “improvement” here and there. 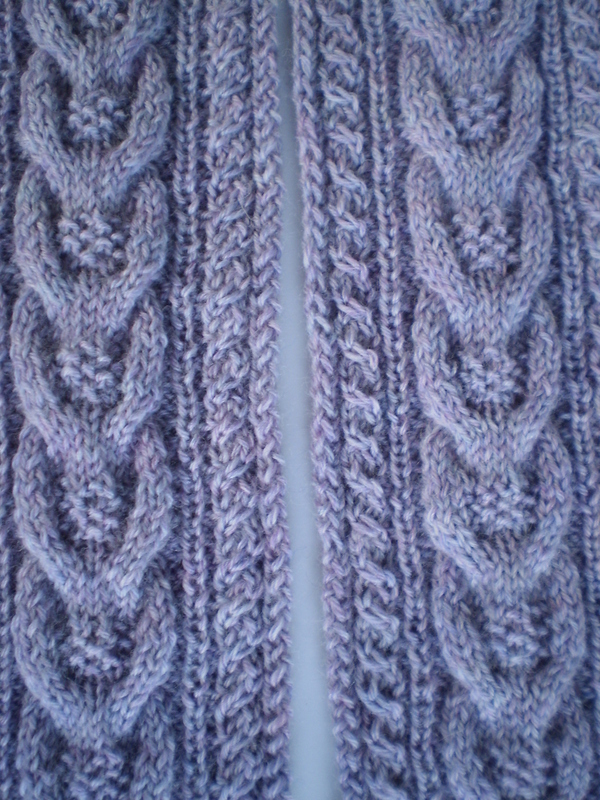 The pattern asks for the little cables to be exactly the same on the left and right front pieces. I decided to make them mirror images. After all, it’s not any extra work, and I think it’ll make the finished product look a little nicer. But that’s IT! No more changes! (Unless I run out of yarn and decide to do something different with the sleeves.) I’m fully enjoying this project! Unfortunately (or perhaps fortunately) I’ve got some more design work coming up, so I don’t know how much more headway I’ll be able to make for a while. But, even if I can’t be working on this project, I know I’ll keep thinking about it. 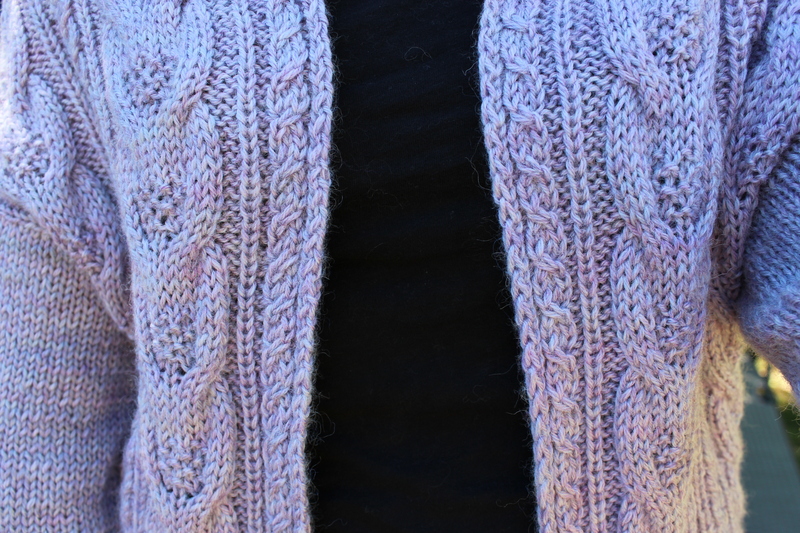 This entry was posted in On My Needles and tagged cable, cables, cardigan, knit, stranger cardigan, sweater on April 18, 2016 by onemilljellybeans.